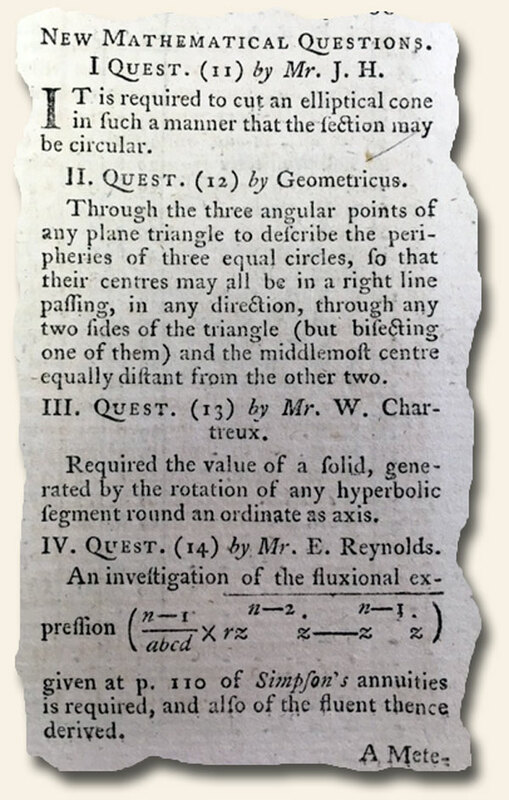 As we continue to explore the diversity of content found on the pages of 18th and 19th century Gentleman’s Magazines, our attention was drawn to the abundance of Mathematical challenges found within many issues – particularly those from the 1700’s. Rather than opining on the difficulty level of the quests as opposed to what might be expected of the average reader of a common (blog) post or publication of the 21st century, especially since we have no idea as to the intended target audience. Instead, let’s just enjoy the challenge as if we were living just prior to the American War for Independence. The challenge: On a somewhat regular basis the publisher would provide a set of Mathematical exercises and invite their subscribers to submit solutions. These responses would then be printed (along with the names of those who submitted them) within a future magazine – typically 1-3 months later. The set shown below is from an issue dated May, 1768. Go ahead and give the problems a try. As an act of 21st century kindness, next Thursday I’ll post the solutions which were submitted in 1768. Are you bold? Go ahead and reply with your solutions prior to next Thursday and allow the collectible world to observe your mathematical genius – or at least your ability to rival the math-prowess of a 17th century 5th grader – or mathematics professor of the period. Enjoy. You do know that 1768 is NOT in the 17th century, but in the 18th… right? You really should fix that.